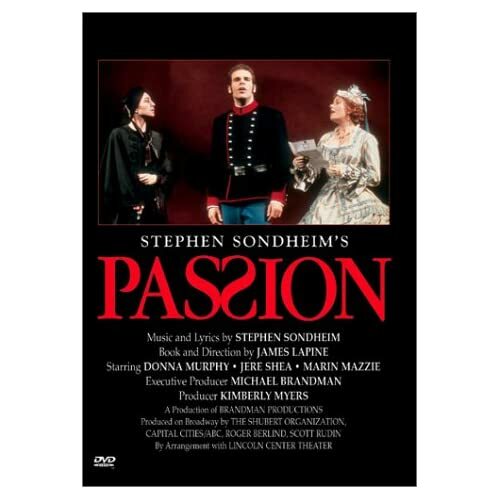 PLOT: Based on the Italian movie Passione d’amore, Stephen Sondheim’s Passion is a story of obsessive love. Giorgio (Jere Shea), a soldier, and Clara (Marin Mazzie), a woman with a husband and child, are deeply in love, but their idyllic happiness is disrupted when Giorgio is transferred to another post. Here he meets Signora Fosca (Donna Murphy), a homely and ill woman who is the cousin of the regiment’s commanding officer. Fosca soon falls in love with Giorgio and pursues him relentlessly, saying “Loving you is not a choice/It’s who I am.” He is repulsed and resists her advances, but eventually he succumbs to the power of her love. From a book by James Lapine, based on Ettore Scola’s film Passione d’Amour. Music and lyrics by Stephen Sondheim. The original Broadway production opened on 9 May 1994 and was directed by James Lapine, running for 280 performances. Hi..I have just discovered your blog.. And ı really liked ur writings, the way u express ur self.. My mum is also a nurse in Turkey and ı live in turkey… I’ll follow ur blog..
It´s no wonder Passion it´s controversial. It´s art at its purest, and Sondheim is a genius.